Flossing every day is a very important part of your oral hygiene. 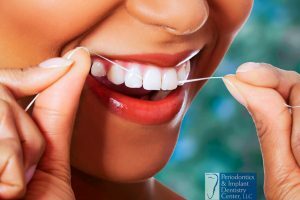 Not only does it feel great to remove food particles and blockage from between your teeth, but flossing can also help prevent some serious health issues. Flossing is a great way to ensure your mouth doesn’t fall victim to gum disease or gum recession. These are painful conditions that can be very serious to deal with, particularly if they go untreated for long periods of time. If you think you might have symptoms of these conditions and would like to visit a gum disease dentist in Fairfield County, CT Periodontics and Implant Dentistry Center of Stamford, Connecticut, is a fantastic option. We are also experts in helping with gum recession in the Fairfield County, CT area. Sure, it’s easy to see the benefits that flossing can provide, but we also wanted to touch on 3 common flossing mistakes that can actually harm your mouth if you aren’t aware of them. People typically floss for two main reasons, to remove food and debris between teeth and prevent bacteria from populating your gums. The tissues of your gums benefit from being massaged and stimulated, but you can also cause more harm than good if you are flossing too vigorously. Using too much force on your gums when flossing can actually cause gum recession and damage your mouth over time. Be cognizant of the pressure you use when flossing to avoid this common flossing mistake. Another flossing mistake that people make is flossing to often. Dental hygiene is certainly important, but there’s a fine line between a healthy flossing habit and overworking your gums. You can prolong gum sensitivity and damage the tissue around your gums by over flossing. We suggest flossing once per day, right after brushing your teeth. This is a healthy habit that can work wonders in your mouth. If you floss too often, you might need to pay a visit to the periodontist in Fairfield County, CT. When you are flossing, it’s important to be cognizant of exactly where you are flossing. You want to target both sides of each tooth to avoid plaque buildup. The gaps between your teeth are important spots to floss as well but try to focus on each side of your tooth below the gum line to get the maximum benefits from flossing.